Hyperconverged infrastructure is now a priority over aspects such as cost reduction, data protection and IT automation. It helps organizations focus on agility and making IT faster, more flexible and more responsive. 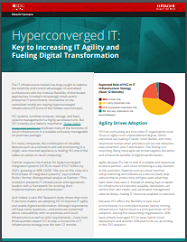 • 52% of respondents say that infrastructure automation, provisioning and management are the top drivers for hyperconverged adoption. • 66% of respondents place scalability among the top benefits of hybrid cloud deployments, while 49% say improved security and control are the biggest benefits. See how your industry peers rate the factors that drive adoption and prioritization of hyperconverged IT in this IDG summary. What is your role in selecting IT solutions at your company? Are you currently exploring related IT or data solutions?